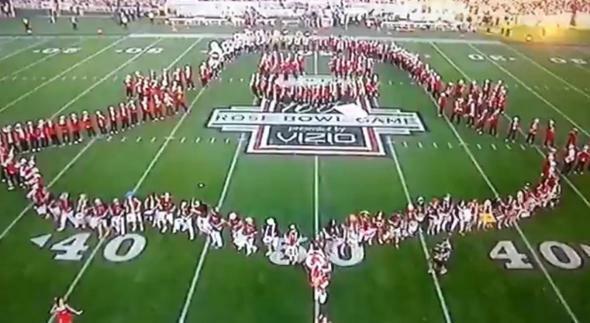 The Stanford band formed the Snapchat logo—ephemerally. Amid the pomp and pseudo-dignity of the 100th Rose Bowl festivities, one performance stood out as refreshingly haphazard and, to most in the audience, thoroughly befuddling: the halftime show by the always-off-kilter Stanford University marching band. The antics are nothing new for a ragtag outfit that bills itself as “the nation’s largest rock’n’roll band.” Last year, it celebrated Stanford’s Rose Bowl matchup against Wisconsin with an “homage to fromage” consisting largely of bad puns about cheese, like “you’re a Muenster” and “it’s Gouda to see you again.” But to those familiar with the band’s colorful history—disclosure: I went to Stanford and had friends who played in the band—its recent performances have seemed, if anything, a little tame. Over the years it has offended millions and been banned from multiple campuses for performances ranging from a potato-famine joke in a 1997 game against Notre Dame to cracks about polygamy in a 2004 matchup with BYU. And of course, there was that unfortunate incident in 1982 when the band ran onto the field before the game was over. As for Snapchat, which was founded by Stanford students, the private-messaging service was one of 2013’s hottest startups, turning down a reported $3 billion buyout offer from Facebook. But it has been rocked in recent days by a hack that exposed millions of users’ account information. Snapchat has downplayed the security breach, but it still seems likely to shake the confidence of teens and others who use the private-messaging service for sexting and other types of missives that they’d rather not preserve for posterity on a site like Facebook. Hey, maybe “Secret Text” isn’t such a bad idea after all. Surely some of those Stanford bandies are clever enough to implement it. But maybe first they should get some tips from their rather more disciplined counterparts in the Ohio State band on how to execute a complex program without any bugs. There was booing. It was great. Too bad we didn’t win. The reader’s account is corroborated by a few outraged tweets from Michigan State fans. No wonder ESPN’s producers were in such a hurry to cut to the GameDay crew. Facebook Reportedly Offered $3 Billion for Snapchat. Snapchat Said No.